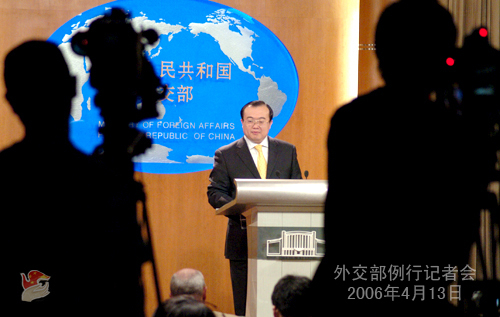 On the afternoon of April 13, Foreign Ministry Spokesman Liu Jianchao held a regular press conference. At the invitation of the Egyptian Government, Turkish Vice Prime Minister Mehmet Ali Sahin and Russian President's Assistant Victor Ivanov, State Councilor Hua Jianmin will pay visits to the three countries from April 18th to 25th. Now, I'm ready to take up questions. Q: Panchen Lama made a presence at the World Buddhist Forum. What's your comment? A: The World Buddhist Forum is sponsored by Chinese State Administration for Religious Affairs. Please refer to them for details. Q: By the end of April, a meeting of the defense ministers of SCO member states will be held in Beijing. Can you brief us on the agenda and the arrangement of the meeting? A: The SCO member states are still discussing on this issue. Once exact details are available, I will keep you informed promptly. Q: Today, the DPRK Vice Foreign Minister Kim Kye Gwan met the press in Tokyo, alleging that the DPRK would possibly move ahead in its nuclear development if the next round of the Six-Party Talks remained elusive. What's China's comment? As the host country, what expectation does China have on the date of the next round of Talks? A: I have not read the remarks of Vice Foreign Minister Kim Kye Gwan. The position of China on the denuclearization of Korean Peninsula and the Six-Party Talks is as follows: all parties concerned should unswervingly pursue the goal of the denuclearization of the Peninsula and seek the solution of the nuclear issue on the Korean Peninsula via dialogue and the channel of the Six-Party Talks. We also wish to see more positive and constructive attitude of the parties concerned in this regard. The process of the Six-Party Talks serves the interest of all parties. China hopes that all parties will show their flexibility on the biggest stumbling block in the way to resumption of the Talks-the financial issue, so as to strive for an early resumption. 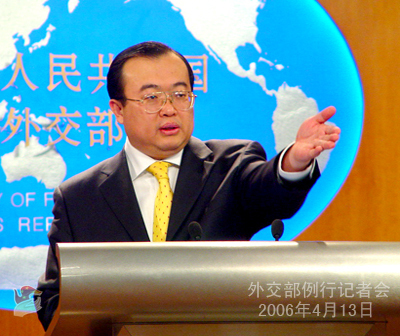 China will continue its active effort to resume talks. Q: Japanese Chief Cabinet Secretary Shinzo Abe said that he would follow Koizumi in his visit to the Yasukuni Shrine if he superseded Koizumi. If he does as true as his words, how do you think China-Japan relations will develop? A: China has expressed on many occasions its position on the issue of Japanese leader's visit to the Yasukuni Shrine, where class A war criminals in the Second World War are enshrined. We hold a firm and clear position on this issue. The history issue, as a major one of principle between China and Japan, bears on the political foundation of China-Japan relations. It is impossible to sideline this issue. We hope that Japan can show their sincerity and wisdom on the history issue and correctly handle the Yasukuni Shrine by proceeding from the overall interest of China-Japan relations. Q: It is reported that on 18th of this month, Russia will hold a consultation on the Iranian nuclear issue that involves a number of countries. What's your comment? A: Recently, there has been some new development on the Iranian nuclear issue. Iran made new talk. We express our concern about the statement of Iran and uneasiness over the possible development of the issue. We call on again the parties concerned to exercise restraint and avoid any move that may further escalate the situation. Only by so doing can the parties help properly resolve the Iranian nuclear issue through negotiation and diplomatic means. In order to boost the communication between the parties concerned and push for a proper solution of the Iranian nuclear issue, Assistant Foreign Minister Cui Tiankai will visit Iran and Russia on April 14th to 18th, to exchange views with the two sides on the Iranian nuclear issue and other international and regional issues of common interest. China is positively considering attending the multi-national consultation in Russia. Q: Today, Head of US Delegation to the Six-Party Talks Hill said in Soul that he hoped to see an early return of the DPRK to the Six-Party Talks, which should be focused on the agreement in November, instead of being distracted by other issues. What's China's comment? A: In fact, all parties to the Six-Party Talks expect the process of the Talks to move on and the Talks to be resumed soon. Now, the US and the DPRK have a financial issue between them, and a solution acceptable to both is yet to be found. China hopes that the parties concerned will show flexibility on the financial issue, so as to help resume the Talks at an early date. We believe that the denuclearization of the Peninsula is more important than the financial issue. Therefore, we expect the parties concerned to remove the obstacle and distractive factors, so as to be fully dedicated to the discussion on the denuclearization of the Peninsula, which bears on the peace and security in Northeast Asia. If no more questions are to come up, I'd like to announce the end now. Thank you.